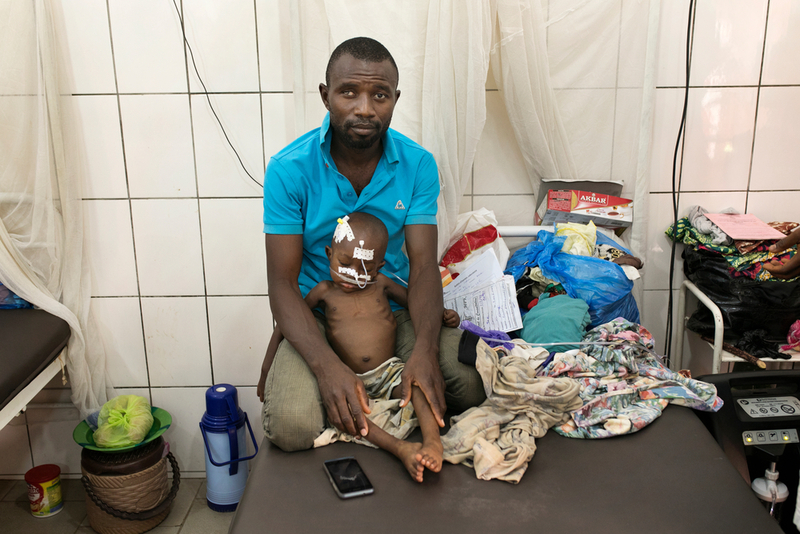 MSF improves access to medical services and develops innovative models of care in Guinea, whose already fragile health system was severely impacted by the 2014–2016 Ebola epidemic. Despite an abundance of mineral wealth, Guinea's people are among the poorest in West Africa. The country has rich deposits of bauxite, diamonds and gold, but due to political instability and a lack of infrastructure, little of this wealth reaches Guinea's population. Ruled by strong-arm leaders for much of the time since its independence from France in 1958, Guinea has been seen as a bulwark against instability in neighbouring Liberia, Sierra Leone and Côte d’Ivoire. However it has also been implicated in the conflicts that have ravaged the region. Along with Sierra Leone and Liberia, Guinea was pushed to the forefront of the world stage in 2014 as the devastating Ebola outbreak spiralled out of control - originating in Guinea itself. Médecins Sans Frontières/Doctors Without Borders (MSF) first began working in the country in 1984. MSF works in collaboration with the Ministry of Health and in 2017 supported almost 11,000 people living with HIV. The project offers HIV testing, treatment and follow-up services, as well as health promotion activities, in six health centres in the capital Conakry. Since December 2016, MSF has also been supporting a 31-bed unit in Donka hospital that provides specialised inpatient care to people with AIDS. In 2017, MSF launched new activities in Kouroussa in northeastern Guinea, where malaria is hyperendemic and the leading cause of mortality. The project aims to develop models of community care targeting children under five years of age that can be adapted to this rural area. MSF currently supports the prefectorial hospital, as well as five health centres. The team is improving access to healthcare by training and supporting community healthcare providers to diagnose and treat simple forms of diseases and conditions such as malaria, diarrhoea and malnutrition, and to identify cases that need to be referred. The project in Guinea maintains full capacity to respond to emergencies such as epidemics and natural disasters. 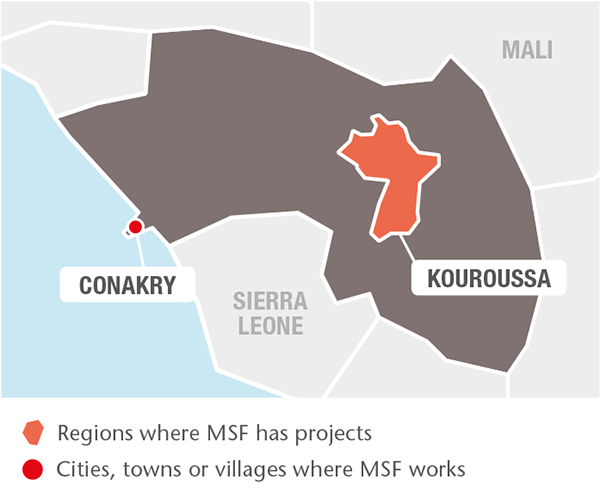 In March 2017, MSF worked with the Ministry of Health to organise the response to a measles epidemic in the five communes of Conakry, vaccinating more than 650,000 children between the ages of six months and 10 years. Father and child affected by meningitis in the intensive care unit.